The philosophy of Henri Bergson rests on two fundamental notions: intuition and duration. Duration (encountered in ourselves as the “stream of consciousness”) is rhythmic, ongoing, and qualitative. It resists mathematical, clocklike description and exhibits fundamental spurts of creativity. (Hence, it exhibits unpredictability in principle.) Intuition, his second basic principle, is for him a direct, unmediated awareness of duration: an immersion in our inner experience which, though immanent in the flow, remains reflective. The opposite of intuition (a sort of third fundamental notion) is analysis, which cuts up the stream of reality into distinct, externally related parts. (It spatializes them). From the time I stumbled onto Bergson’s works in the stacks of the main library of the University of Texas, this lopsided caricature of his philosophy struck me as both insufficient and inaccurate. 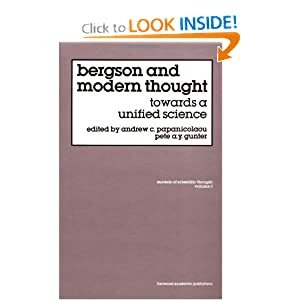 Bergson’s painstaking study of the sciences, his very evident efforts to create a philosophy which remains in contact with them, do not fit with the prevailing portrait of him as a destructively anti-scientific thinker. Rather, it seemed to me that with his criticism of various forms of analysis and his probing of various modes of duration he was trying to suggest new modes of scientific thought, new directions in science, the arts and elsewhere. (After his first book, Time & Free Will, he was to extend the notion of duration to all aspects of nature, not just the human mind).This does not seem anti-intellectual. And it certainly is not destructive. Believing such a view is easy. Proving it has been difficult. It is necessary, first, to examine what Bergson means by terms like intuition, duration, and analysis; and second, to see how he actually uses them. In both cases, one is compelled to understand his method, which involves the interaction of these terms. In attempting to gain a balanced picture of Bergson’s thought, I came to realize that what he termed “intuition” was neither an epistemic dead end (a realization with no results) nor some sort of elegant irrationality (lacking, hence, conceptual content). Rather, it is understood by him as containing conceptual or noetic content derived from the experience of duration: content which can be developed, formalized, made useful (or testable). An intuition, then, is understood as a brilliant insight which, when expressed, can create a new science or, more broadly, a new kind of art, or a new ethical standpoint. This today is considered an outrageous claim. The contemporary majority viewpoint assumes that analysis is not only necessary condition of both philosophy and science but a sufficient condition: all we need. Bergson (and this writer) do not deny the importance and the necessity of analysis. But it is not clear that analysis suffices. New modes of analysis can spring up, replacing the old (that is, analysis has a history). These will be made possible by creative intuitions. Once this fundamental contention is clarified, an accurate notion of Bergson’s treatment of intuition, duration, and analysis emerges. This in turn makes it possible to see how the French intuitionist was able to suggest new sorts of valid research. Bergson’s relentless probing into the varying modes of duration, I have managed to discover, found applications in chronobiology, in wave mechanics, in physical cosmology, in nonlinear thermodynamics, in memory science, and in psychotherapy. In the arts his investigations of duration and memory have, beyond their general impact (which was significant), found expression in the stream of consciousness novel (notably in the writings of Marcel Proust) and in twentieth century modernist painting (notably in the work of Umberto Boccioni and Henri Matisse). Bergson’s contrast of the open and the closed society played an important role in the formulation of the United Nations Universal Declaration of Human Rights. These discoveries go beyond Bergson or any particular philosopher. 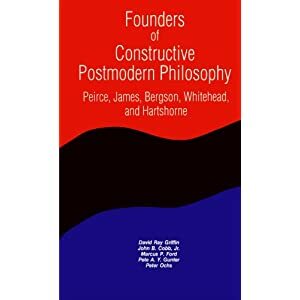 They show that philosophy can be not merely a way of sanitizing received opinions with improved syntax or forever analyzing some murky paradox, but a source of new vistas, new conceptual possibilities. I don’t expect you to remember it, but in the second part of your response to Randall Auxier, when you describe how your argument is with Ilya Prigogine “who thinks, as Whitehead expressed himself, that for Bergson the intellect is always a spatializer and can never think real time,” in you mentioned that Bergson was “puzzling about some new way to analyze the organism that would not leave out duration…” Well, in all my readings of Bergson where he talks about how intuition works, I have always been struck by how much Bergson’s description of intuition jibes with how meditation works, particularly Zen and/or Vipassana meditation. Meditation attempts to do exactly this, that is, to ‘analyze the organism’ that is oneself by letting the working of the intellect fall away in order to “tune” into the living self as it exists at this moment (i.e. duration!). All of Zen’s paradoxical koans, for example, attempt to quiet the intellect by presenting it with linguistic/logical paradoxes in order to place it conflict with itself until, eventually, it “lets go” and fades into the background, leaving pure duration. Of course, it’s not called “duration” in Buddhism, nevertheless what it describes as the meditative state (and from what I have intuited myself during meditation) is just exactly what Bergson describes as intuition. In any case, I think the parallels are more than mere coincidence. As *the* expert on Bergson I wonder if you have noticed that too? You may not know much about Buddhism (and I am no convert), but my point is not to say “Bergson = Buddhism” or any such nonsense. My point is to explore what these two systems of thought might have to teach each other. I don’t personally subscribe to any religion or philosophy, but only take from each what makes sense to me in terms of what I see in the world. I have read much of your writing, and look forward to reading more. Bergson really “speaks” to me; I think he’s was is really on to something that is true and significant. And I think you have done a superb job of explaining him to people! Thanks for reading, and best wishes!